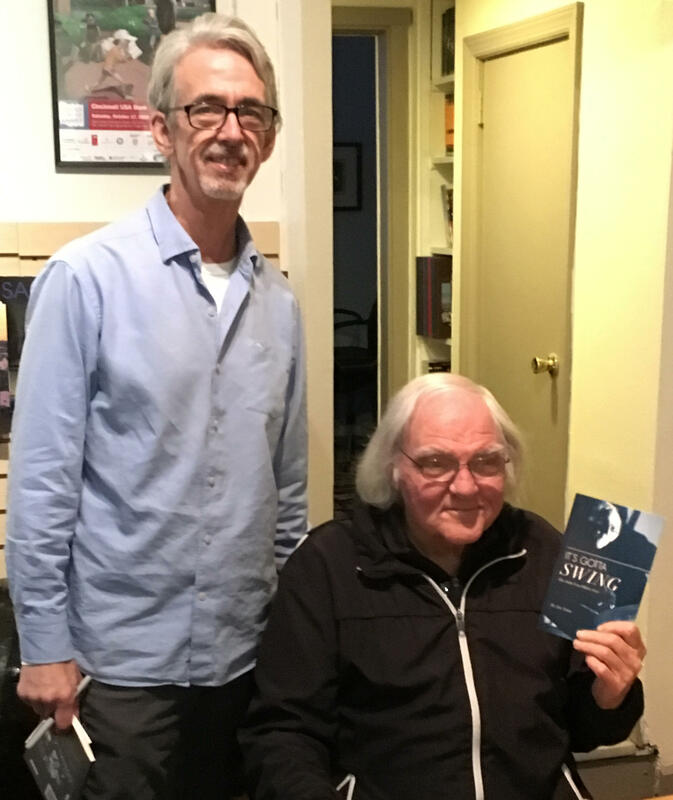 Jim Nunn standing next to John Von Ohlen at a recent book signing. WVXU-FM aired a celebration of John Von Ohlen's career in 2009. At Covington's Roebling Point Books & Coffee, Von Ohlen told him about his 50-plus years in music – touring with the Stan Kenton and Woody Herman big bands; co-founding the Blue Wisp Big Band; playing jazz with Keith Jarrett, Kenny Poole, Benny Carter and Cal Collins; keeping the beat for singers Tony Bennet, Rosemary Clooney, Mel Torme, Perry Como and his long-time girlfriend Mary Ellen Tanner. Someone had to tell the story. So he did it himself – as he will explain on WVXU-FM's "Around Cincinnati" Sunday Jan. 8 (7-8 p.m.). 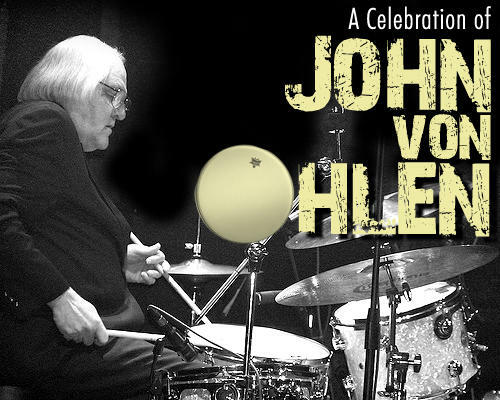 Titled "It's Gotta Swing: The John Von Ohlen Story," Nunn's 106-page self-published book tells how Von Ohlen fell in love with drums when he heard Stan Kenton's band play as an Indianapolis teen-ager. "He started to play music, and learned how to read music at an early age. He played rock 'n' roll for a while, but he had to play the music he was comfortable with," Nunn says. The 1979 University of Cincinnati graduate worked at Milford's old WLYK-FM and at WCKY-AM before moving into book sales in 1986. Nunn also played drums in garage bands as a Terrace Park teen. "It's Gotta Swing" is available for $17 at Roebling Point Books & Coffee, the Booksellers At Fountain Square, Joseph-Beth Booksellers and Amazon. The Nunn interview opens "Around Cincinnati" at 7 p.m. Sunday. And here's a link to Lee Hay's 2009 WVXU-FM program celebrating Von Ohlen's career, and Hay's 2014 tribute to Mary Ellen Tanner.